Women who want to grow stronger in their faith will enjoy this study filled with biblical examples to follow. - Publisher There are many different kinds of Christians -- some are vibrant and growing, others are barely surviving. The good news is that God desires growth for all of His children and has provided everything we need to grow in our knowledge of Him.^Jesus Changes Women examines the various elements of spiritual growth and helps women discover how they can grow strong in their faith. If you want your faith to be alive and growing, this study guide will help you learn what it means to constantly become more like Christ. - Publisher Jesus Changes Women examines the various elements of spiritual growth and helps women discover how to grow strong in their faith. ^By looking at the lives of biblical women such as Deborah, Mary, Hannah, this Bible study teaches women how to root themselves in God's love, nourish their faith with Scripture, and enjoy fellowship. There are many different kinds of Christians -- some are vibrant and growing, others are barely surviving. The good news is that God desires growth for all of His children and has provided everything we need to grow in our knowledge of Him.^Jesus Changes Women examines the various elements of spiritual growth and helps women discover how they can grow strong in their faith. If you want your faith to be alive and growing, this study guide will help you learn what it means to constantly become more like Christ. 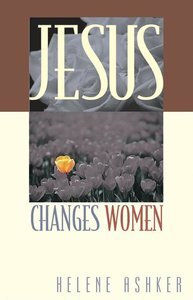 Jesus Changes Women examines the various elements of spiritual growth and helps women discover how to grow strong in their faith. ^By looking at the lives of biblical women such as Deborah, Mary, Hannah, this Bible study teaches women how to root themselves in God's love, nourish their faith with Scripture, and enjoy fellowship.